This is a very special event in its 17th year that allows you to see the crafts that made and continue to make Florence a great artisan city. Approximately 100 small local craftsmen are selected to set up stands in the centuries old Corsini garden off Via della Scala to showcase and to show you what their work entails. Nowadays, we all take for granted that everything gets made in a machine most likely in China. Not true! In Florence and Tuscany, the centuries-old tradition of artisan work and craftsmanship still continues today even if it gets difficult to pass on the passion and dedication to new generations. The artisans will share the techniques passed down through the centuries in making bronze, wood, glass, iron, paper and marble objects. 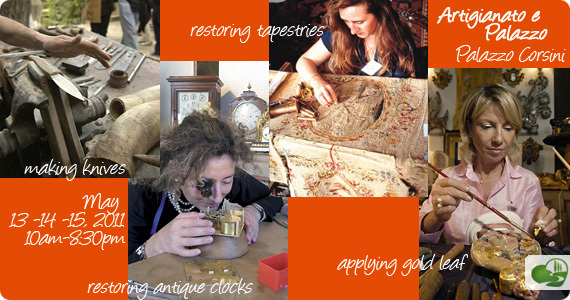 Gold leafing, jewel making, printing, pottery, scent making, hat making, restoration of marble and stone inlaid furniture and much much more. We highly recommend making your way to Artigianato e Palazzo as it shows firsthand the unique crafts that make Florentine and Tuscan products unique in the world.